FINALLY! you closed on the land and now you own it. One might assume that the next step to getting started on your new home is getting the plan. The excitement and dream of the perfect home takes over your life. You are zealous to get started on the plan and have been watching home buying, home improvement and design shows on TV. All your ideas are begging to be nailed down. These ideas incorporate all the new green build techniques and the high tech amenities that make life easier. After choosing a decorated local designer, you work with them endlessly putting together the best plan. You spend your time at meeting after meeting and many late nights pouring over your plan so you can get every detail right. You’ve got the kitchen size you want and the great room is grand with a custom fireplace. The bedrooms are strategically located and carefully planned to include full baths and walk-in closets for each. Moldings galore, low voltage lighting and the smartest house accessories on the market are included. The designer has been extremely helpful with many revisions as plans changed through the process and when it was complete you couldn’t be happier…. until you start to shop the plan around. OVER BUDGET: That’s when you realize that the home plan you paid for and so meticulously planned is well over %35-40 of your whole home budget. How could this be? After all, the designer gave an estimate of costs before you got started but the actual bids of the costs were much higher than what was estimated by the designer. You don’t want to get caught in a situation like this! WHAT YOU NEED: It takes careful planning and designing to come up with a budget and home that fits your needs. Design only firms are not as familiar with the actual build costs like the home builders who work with the numbers every day. 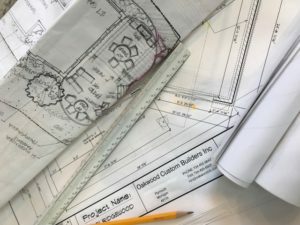 What you should be looking for is a design/build firm who can take your dream of home ownership and put that into a real plan that fits your budget. At OAKWOOD CUSTOM HOMES we are a design/build firm, we do both. In working with us your designs and ideas are put together with actual costs and you are in control of how much your home will end up costing in the end. We give many options to realize the most for your money in design and amenities. We can help you choose functionality, aesthetics, the latest in high tech amenities and good quality products that make your home stand apart from the rest. Our plans are one of a kind designs taking into account each homeowner and their individual personalities.